Part of our new line of mid-depth racks, the SR42UBMDEXP is an expansion model with a depth of 36" (927mm) and width of 24" (600 mm). An expansion cabinet is ideal when several cabinets are bayed together. It has doors and a roof but no side panels. Its integrated baying tabs make it easy to combine multiple enclosures in rows fro data center application. The SR45UBMDEXP is also compatible with hot aisle/cold aisle configurations. The SR42UBMDEXP houses 3000lbs of standard 19-inch rack equipment in 42U. Offers vendor-neutral square hole/cage nut mounting for guaranteed compatibility with all EIA-310-E compliant 19" equipment. Its front and rear pairs of vertical rails are adjustable in quarter-inch increments from 4 to 31 inches. Adjustment is quick and an easy-view depth index ensures consistent rail placement without requiring time-consuming measurements. 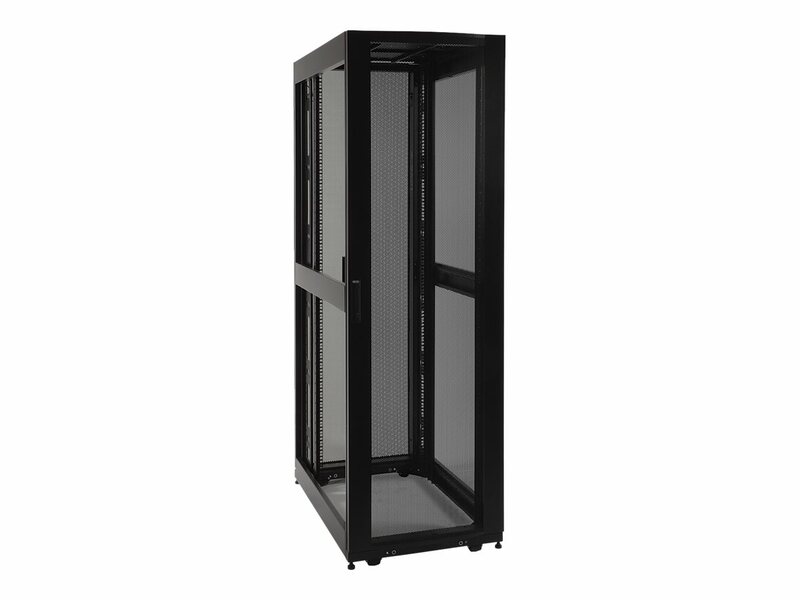 Each rack space within the enclosure is numbered for ready reference. Two of these adjustable vertical mounting rails support toolless button-mount 0U installation of up to four compatible PDUs and cable managers. This feature makes it easier to route cabling to rack equipment and reduces cord clutter. The top panel of the SR42UBMDEXP is vented to help remove warm air from the enclosure and draw in cool air by convection. 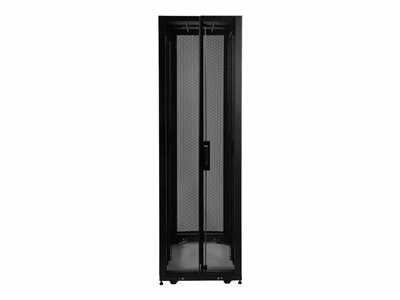 The top panel includes ports for cable routing, and can be quickly removed without tools. To facilitate cable access, the SR42UBMDEXP is open-bottom. All components of the SR42UBMDEXP are grounded to the enclosure frame. Front and rear threaded grounding points are provided for connection to the facility earth ground. The removable front and rear doors feature quick-release ground wires. To simplify deployment, the SR42UBMDEXP comes with preinstalled casters that enable it to be easily maneuvered into the desired location, where it can be secured by adjusting the preinstalled levelers. Note: the casters are intended for minor position adjustments and are not designed for moving the enclosure over long distances. The SR42UBMDEXP comes with a 5-year product warranty. As part of the SmartRack family, the SR42UBMDEXP is compatible with Tripp Lite's extensive range of rackmount accessories, enabling you to customize your solution to meet any requirement.